Marine test site for emerging oceanic technologies focused on ocean energy converters. PLOCAN is a Public Consortium ruled by the Spanish Government and the Regional Government of the Canary Islands. PLOCAN is a marine scientific and technical infrastructure to facilitate the development of new oceanic technologies providing different services to the enterprises and researchers. The five strategic lines are: ocean observation, underwater vehicles, marine test site, platform of innovation and Training centre. The site is located on the east coast of Gran Canaria Island of the Canary Islands in Spain. It is located at the border of the continental platform with depths between 20-600m in the Atlantic Ocean. This test site is operative without grid connection since 2010. Grid connection is expected by the end 2016. A total capacity of 10 MW will be installed. The Regional Government of the Canary Islands was in charge of the environmental procedure. The Authorization was issued in April 2013 to install the submarine electrical infrastructure and wave energy converters. The test site area has been authorized by the Council of Ministers agreement of 14th March 2014. This test site has a marine area of 23 km2. Avrainvillea canariensis: Algae declared as “Interesting for Canary ecosystems” by the Regional Law 4/2010. Mäerl: Include in the Annex V of Habitat Directive. 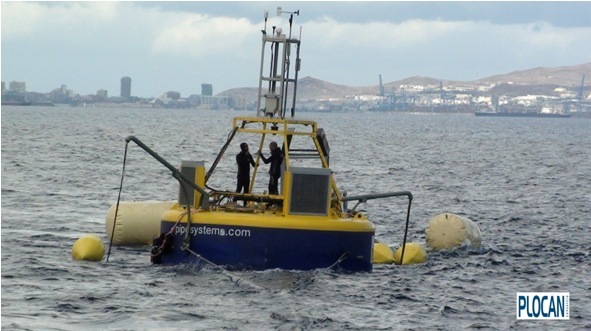 PLOCAN Marine Test Site for Ocean Energy Converters is located in Spain. Survey conducted with multi-parameter probe: salinity, temperature, pH, turbidity, oxygen. Sampling with oceanographic bottles. Parameters: nutrients, pigments, metals, pH, salinity, oxygen. Geophysical - sediments morphology, type and quality (metals, PAHs, PCBs, Organic matter). Van Veen dredger to collect bottom samples. Sand, Gravels and Rocks. No contamination detected. Electric and magnetic field measurements. Report in Spanish. English summary report is pending. Video transects, previous existing information, sampling. Study of fish and fisheries in the area. Presence of some species of sharks documented. Local fisheries activity. Presence of marine mammals in the area. Few mammals and turtles. Report in Spanish. English summary report is pending. Review and consulting existing information. Slight interaction with local fisheries. In Situ: temperature, conductivity, pH, oxygen, turbidity, chlorophyll, hydrocarbons, wind speed and direction, air temperature, atmospheric pressure, rain, relative humidity, radiation PAR. Seasonal boat based survey with multi-parameter probe. Laboratory: nutrients, pigments, metals, pH, conductivity, oxygen. Seasonal boat based sampling with oceanographic bottles. Permanent deployed monitor noise systems. Electromagnetic field monitoring produced from cables and submarine station. Monitoring the impact on benthic communities. Monitoring the presence of fish, particularly sharks.